Thanksgiving is right around the corner, can you believe it? It feels like it came way too early this year but nonetheless, we got to be ready! I have a delicious potato recipe for you that will be a nice change from the typical baked potato. 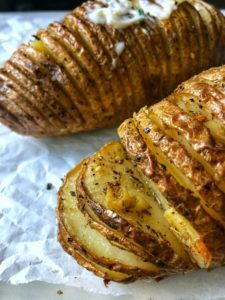 These Hasselback potatoes are tender and have crisp edges and great flavor. They will make a great addition on ay dinner table. If you aren’t a fan, you should definitely try my chimichurri potatoes or herb potato salad! All I know is you have to have potatoes on that table folks! Scrub the potatoes to make sure they are clean. Leave the skin on. Cut the bottom of the potato straight so it doesn’t move on the sheet pan if you need to. Slice the potato into thin slices making sure not to cut all the way through. Put the potatoes on a non-stick baking sheet. *Make sure to slice them thinly. In a small pot, melt the butter and oil together. Add all the herbs and garlic. Cook together for 2-4 minutes till fragrant. Brush the potatoes generously with the oil mixture all over. Salt & pepper generously as well. Then, take out and add more olive oil and open the slices a little bit more with your hand or a knife. Add the garlic pieces from the oil in between a few slices to keep them open. Season once again. Place back in the oven for another 50 minutes till tender and crisp edges. Season again. Brush with extra oil. 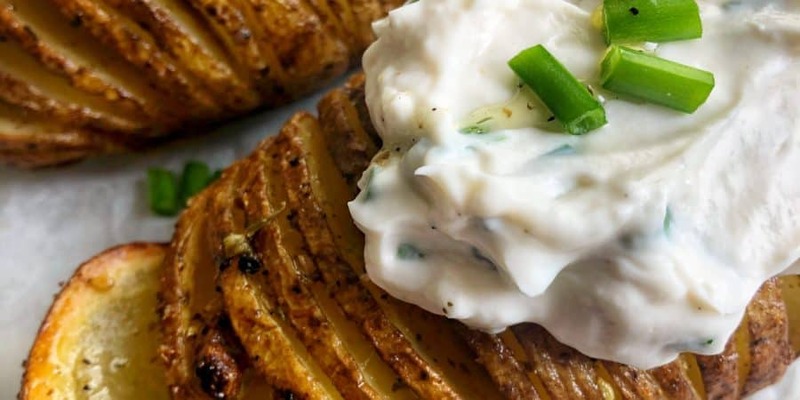 As for the topping, whip together the sour cream or cream cheese with the chives and top the potato!